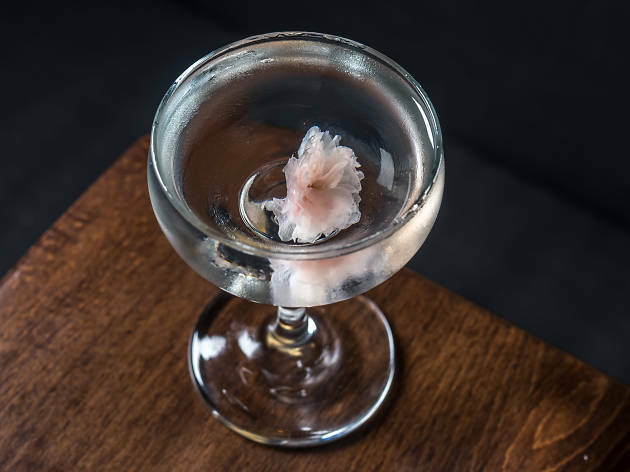 When a sake-and-spirits temple with a Pegu Club–pedigreed barkeep lands on the Lower East Side, there’s no avoiding the chorus of cocktail-geek fanfare to follow. 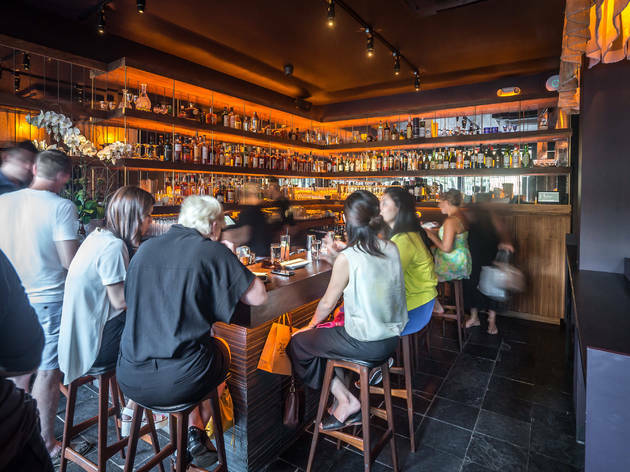 Yet take a seat at Kenta Goto’s glimmering black-and-gold boîte, lodged away from the Houston Street bedlam, and you’ll find the noisy hype storm is curtailed by cool poise, from the hostess’s graceful reception to silent servers weaving through tables. 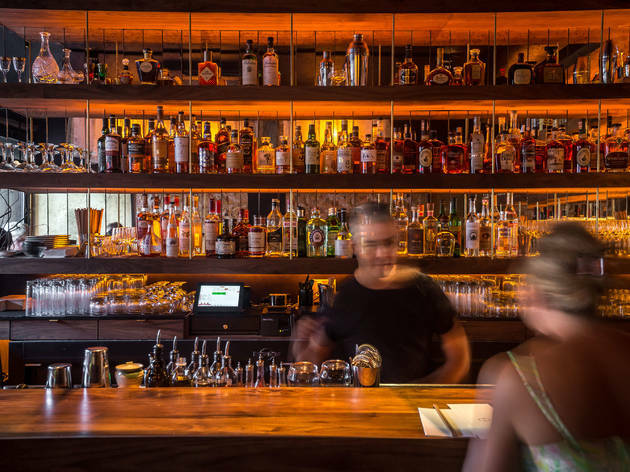 In the absence of distractions, focus directs to the well-lit bar, where Goto effortlessly stirs his Far East–whispered creations, drawing on his Japanese heritage as much as his lauded tenure at Audrey Saunders’s cocktail trailblazer. ORDER THIS: Potent riffs on the classic cocktail canon spotlight their principal spirits but relent to their maker’s artful tweaks. A delicate cherry-blossom-garnished Sakura Martini ($15) boosts gin with swirls of junmai sake and maraschino cherry liqueur, and the tawny Plum Sazerac ($15) updates the original New Orleans recipe by swapping rye for woody bourbon and adding splashes of slivovitz, a stiff Slavic brandy made with damson plums. 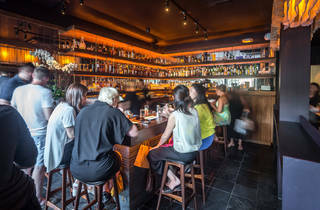 GOOD FOR: Enjoying immaculately plated Japanese tapas alongside your sake. 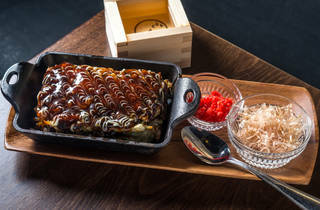 Dishes from chef Kiyo Shinoki (Bohemian) arrive on cast-iron pans atop blue-and-white porcelain plates and in light cedarwood boxes. The latter snugs a handsomely assembled tako sashimi ($13), offering the still- chewy, blanched tentacles with house-blended soy and chili-miso sauces, while battered miso wings ($10) get a second layer of crunch from flecks of roasted black sesame. The bulk of the menu centers on one of Goto’s favorite childhood snacks: okonomiyaki. Along with a pork-and-shrimp standard ($12), there are welcome revisions like a grilled cheese version, melting white cheddar, Parmesan and Gruyère ($12). 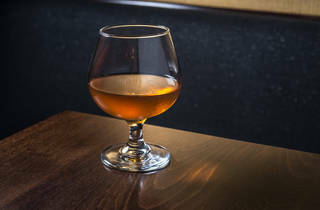 THE CLINCHER: Goto joins the ranks of notable bar talent rightfully helming its own drinks sanctums (see Ivy Mix at Leyenda, Jim Kearns at Slowly Shirley), and that newfound control is felt throughout his namesake watering hole. 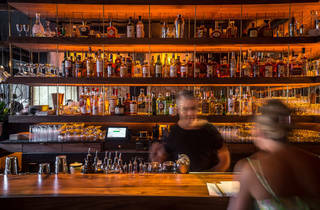 Like the cocktails, the 30-seat space’s elegantly composed trappings (dark purple walls, amber lights) are synonymous with Goto’s understated approach. 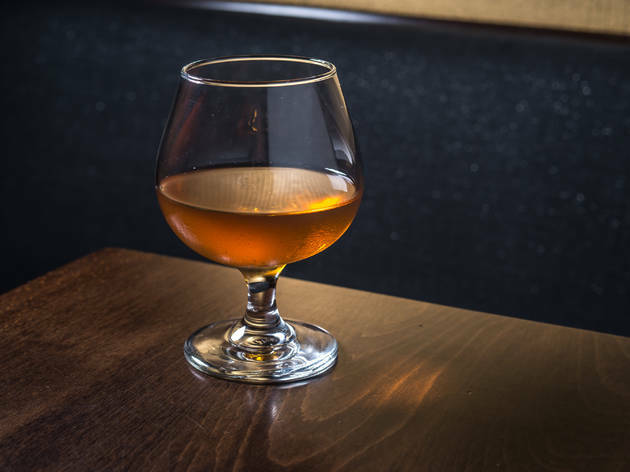 The drinks maven charmed riveted guests on a recent night, but you don’t need to exchange a single word with him to be fully swayed by his boozy gospel. Average drink: $10. AmEx, MC, V.
I've been wanting to try Bar Goto for some time and I finally made it. 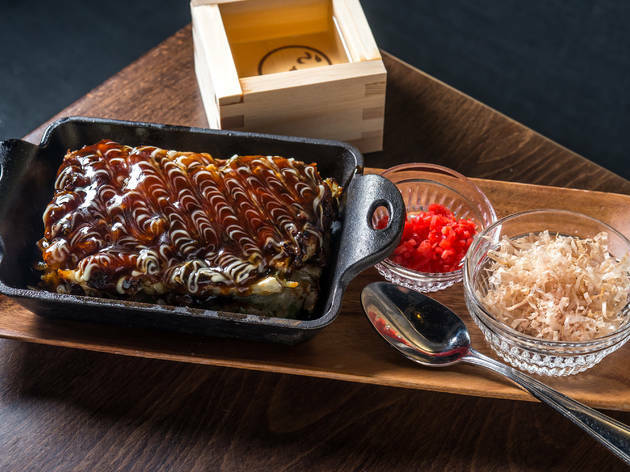 This sliver of a space that's just steps away from the horror of Houston has the most beautiful okonomiyaki I've ever seen. And it's really good too. The celery and wings are also must-orders, but skip the burdock fries as I thought they were way too chewy and bland. The cocktails were great and inventive. I enjoyed my Sakura martini and my boyfriend's Jersey Kilt was a perfect, smokey drink for a cold night.